Can I get heated seats? Do I have to get a sunroof? Find out what you need to know about Mercury features right here. Keyless entry keypadUnlock the car by entering a code on a door-mounted keypad. Unlock the car by entering a code on a door-mounted keypad. Remote window/roof operationOperate the power windows, sunroof, and/or convertible roof using buttons on the keyfob. Operate the power windows, sunroof, and/or convertible roof using buttons on the keyfob. 911 assistAutomatically contacts 911 through a linked cell phone in the event of a severe collision. Automatically contacts 911 through a linked cell phone in the event of a severe collision. Post-crash alert systemSounds horn and flashes hazad lights if airbags or seat belt pretensioners have been activated. Sounds horn and flashes hazad lights if airbags or seat belt pretensioners have been activated. Safety keyIndividual keys can be coded to enforce specific driving restrictions, such as maximum speed and audio volume. Individual keys can be coded to enforce specific driving restrictions, such as maximum speed and audio volume. CD changer, in-dashIncludes CD player. Media driveBuilt-in drive with at least 10 GB of storage for MP3 and other audio files. Built-in drive with at least 10 GB of storage for MP3 and other audio files. 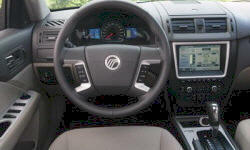 Navigation, turn-by-turnSimple directions displayed on rudimentary screen and/or spoken over audio system. Fee after first 3-12 months. Simple directions displayed on rudimentary screen and/or spoken over audio system. Fee after first 3-12 months. Speed-sensitive wipersOnly listed when pricing a single model because insufficient data for all cars. Voice control for external devicesPhone or other device operated via the vehicle's voice command system. Requires a compatible device--all aren't supported. Phone or other device operated via the vehicle's voice command system. Requires a compatible device--all aren't supported. Bright-finished mirror housings (optional)Chrome or aluminum mirrors. Only listed if optional or not standard on the base trim. Chrome or aluminum mirrors. Only listed if optional or not standard on the base trim. Large color reconfigurable instrument cluster displayThe information displayed by the instruments can be customized. Color display(s) of at least 20 square inches. The information displayed by the instruments can be customized. Color display(s) of at least 20 square inches. Manual lumbar adjuster, driver seatManually adjustable lower back support. Manually adjustable lower back support. See TrueDelta's information for all Mercury models. 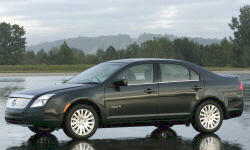 None of our members have yet commented on the available features of the 2011 Mercury .